Would you like to see the time you’ve spent last week in a report like this? This is a mockup report for our upcoming product, Sparkling Sheet – it is a time tracking software to help you be more productive. As it geared for self reporting, its designed to be used “as you go”. That is it’ll be easier to use than paper and you can use it on the get-go without the dreaded initial setup of tasks and projects. As you can see for yourself, the report has some elements of gaming within it. That is it expresses your activities in terms of achievement scores. Pretty similar to a game’s scoreboard or avatar stats. 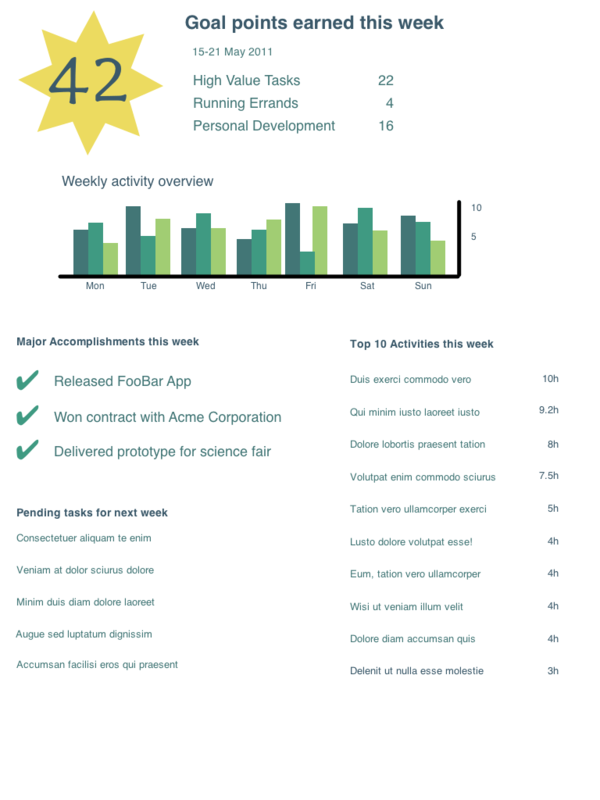 Hopefully this will help you get a sense of how much productive your week was and can easily compare it with your last week’s achievements. If you like what you see, please consider signing up so that you will be be the first to know when we launch it.